Size does matter! In the case of microservices and functions, I’d much prefer a smaller, leaner footprint as opposed to the often overly bloated frameworks we’ve seen floating around the enterprise landscape. Project Flogo, was written entirely in Golang with the goal of running highly performant microservices in the smallest possible footprint. 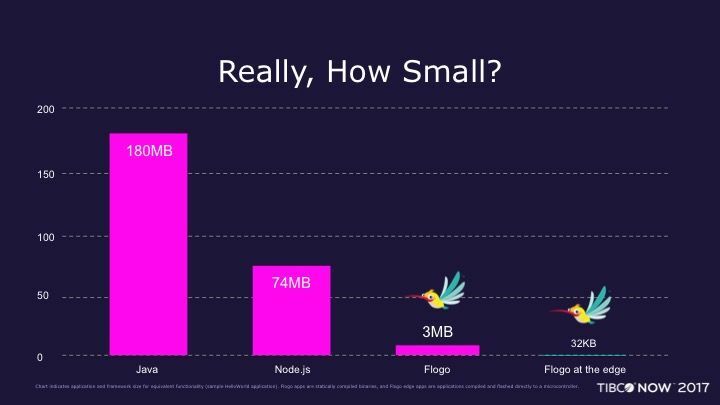 We’ve seen services built with Flogo up to 50x smaller than comparable services built using different frameworks. Consider the following diagram that depicts the size difference. Another important point to highlight is that Flogo is designed to embrace the concept of a single unit of work, or in Flogo speak: the flow. The flow is a unit of work consisting of one or more activities that contribute to the overall business logic. A flow can be thought of as a function, in the sense that a single flow has both input and output params, as does a function, and executes a specific set of tasks. In fact, we launched first-class support for AWS Lambda last October at our user conference TIBCO NOW, making Flogo the first microservices/function framework to seamlessly support and work with AWS Lambda. 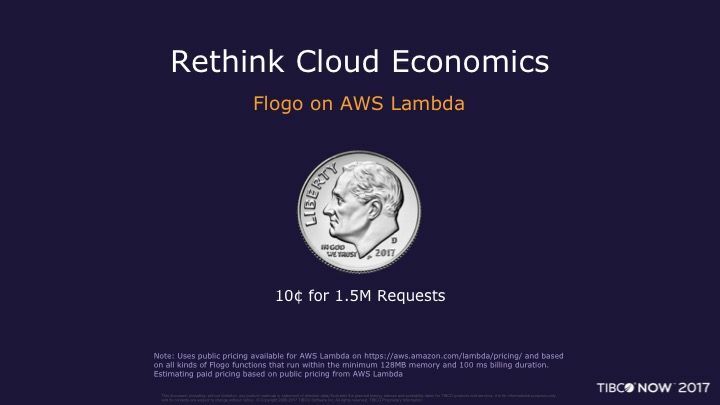 The possibilities created by AWS Lambda’s pay-as-you-consume model and Project Flogo’s unparalleled lightness is truly exciting! I can’t wait to see what the Open Source community and our customers build with these tools, not to mention the potential for massive cost savings that they’ll benefit from! Checkout flogo.io or github.com/TIBCOSoftware/flogo to grab the latest version with AWS Lambda support.